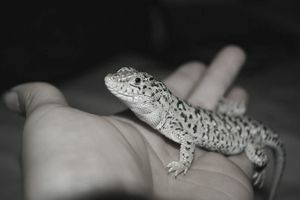 Although very new on the pet lizards scene, the steppe runner is rapidly gaining a reputation as a rising star in the reptiles world, and pet industry experts predict that they are about to take center stage among exotic pets. Unlike other small reptiles that can often be skittish and somewhat bashful, such as the leopard gecko and bearded dragon, these scaly cuties are the Mr. and Ms. Personalities of the lizard world in that they are easy to care for, extremely friendly, even-tempered and enjoy being handled by humans. They are also hardy; enjoy robust health with proper care; they are inexpensive (often costing between $30 and $50); have a lifespan of about 10 years, and are as cute as the proverbial button. These reptiles are especially good for beginner lizard parents, especially kids, due to their calm nature and overall patience with humans. Because they are so new to America, they but are sure to gain popularity rapidly once people find out about them, it's important for pet retailers to familiarize themselves with these pets. Be the first on your block to know all about these delightful critters. The scientific name for these animals is eremias arguta. Introduced into the American pet industry in 2012, these reptiles hail from the desert regions of the Ukraine, Romania, and Southwestern Russia. They grow to an average length of 6 inches. They are diurnal, meaning that they are active during the day. They enjoy being hand fed, and they will curl up in a human's hand due to their fondness for warmth. These reptiles are insectivores that require gut-loaded crickets and mealworms, which should be dusted with a vitamin supplement containing calcium and vitamin D3, according to the Reptile Channel. The site recommends dusting with supplements prior to every feeding for babies; every other feeding for the grownups. These pets can be fed every day or every other day. These lizards may have waxworms, but should only be given these as an occasional treat due to the high-fat content of these, lest they get tubby. The Reptile Channel also cautions to place the insects in a bowl, as to prevent the reptiles from ingesting the substrate. And don't leave live insects in the pets' habitat for long periods because they could bite the lizards. Important: These reptiles should never be fed lightning bugs, which are toxic to them. As with an insectivorous pet, customers should be cautioned to never feed these animals insects they catch themselves, as they might have been contaminated with harmful pesticides or diseased. As I always emphasize with virtually every pet, these guys must have access to fresh water at all times. Those who wish to deal with these pets are well advised to stock lots of sturdy water bowls that cannot be tipped over. Be sure to instruct steppe runner parents to keep the water dish on the cooler side of the habitat. Furthermore, the water should be free of chlorine and heavy metals; bottled water is recommended over tap water. The water must be changed and bowls cleaned regularly because these guys are known to use their water bowls as swimming pools - and potties. Ew! These pets require glass terrariums that are a minimum of 10 gallons, although 20 is better. While these reptiles are ground dwellers and not known climbers, their tanks should contain sturdy, well-ventilated lock-on metal screen covers to prevent them from escaping. In order to mirror their natural habitats, steppe runners need a warm and cool temperature gradient on either side of their tanks. The Reptile Channel says that the cooler gradient should be between 75-80 degrees; the warmer end should be 78-82 degrees; the basking area should be approximately 100 degrees. Experts recommend the use of UVB bulbs, which may be left on for 8-12 hours a day, then turned off at night. It’s also advisable to have thermometers to monitor the temperature on either side of the tank. Meanwhile, the humidity level in these reptiles' habitats should also be kept low. As for substrate, many fans of these reptiles recommend play sand. But Specialized Care for Avian & Exotic Pets, which offers veterinary care for these pets in Western and Central New York, Eastern Ohio, Northern Pennsylvania and Ontario, Canada, says that shredded aspen is best. These lizards may accidentally ingest sand, which can cause tummy blockage. Important note: According to Specialized Care for Avian & Exotic Pets, these reptiles should not be housed with other species of lizards. In addition to the aforementioned supplies, these pets enjoy hiding caves, wood pieces and flat rocks for basking. Do not use heat rocks, which distribute heat unevenly and can burn the lizards. For these supplies, I highly recommend the Rolf C. Hagen company, a long-respected global manufacturer, and distributor of pet products that puts out a great line of reptiles products called Exo-Terra. I encourage pet retailers who service the reptiles market to learn as much as they can about these lovely lizards because they are about to become major stars on the exotic pets stage. Is Veterinary Practice Ownership Right for You?